Shaving cream backgrounds was a technique I tried in the Summer holidays with my girls and we loved it. It is amazing the different looks you can achieve and no two sheets will ever be identical. This was one of the first colour combinations we tried. The cardstock used is Basic Black, Island Indigo and Pool party with Very vanilla card as the base for the background. As it was the background technique that I was trying out, I've kept the card simple and added one of my favourite layered butterflies using the Butterfly & Bold Butterfly thinlits dies. The layered butterfly is adorned with one of our Iced Rhinestones and the Birthday greeting comes from a vintage set called Well Scripted. It was punched and layered with the XLarge Oval and Decorative label punches. Below I have a pic of some of the other sheets we created. Thanks so much for stopping by today. I hope you're all having a great weekend. Here's a card made for a friend of mine for his 40th. I really couldn't wait to try out my new number dies framelit dies for this card. Come and have a look. The stamp set I've used is a vintage one called Rev up the Fun and the cardstock I've used is Basic Black, Island Indigo and Very Vanilla. I've also used a little bit of patterned paper for the banners and embellishment from the stack called Going Places. I think its excellent for male cards. Below is a closeup of the card frontt. This is the inside of the card and shows the number panel on the base. I raised that panel up on dimentionals to become the anchor for the Easel. Here is the front view of the finished card. Happy 40th Brock, I hope you had a great celebration. I had a simple Catalogue launch on Valentine's weekend to kick off our creative juices and to introduce the ladies back and share with them some of the new products available during Sale-a-bration. This is one of the Make and takes. This card uses the Sale-a-bration stamp set called The Sky is the Limit. All the ladies were able to stamp a second plane image for fussy cutting and raising on top of the base. However due to my shoulder surgery, I kept my sample basic. We did some simple sponging on this as well. The cardstock is Basic Black, Lost Lagoon and Very Vanilla. The embossing folder used on the background is called World Traveller. This one was quick but effective. We love to hear what you think, so please feel free to leave me a comment, and have a great day. 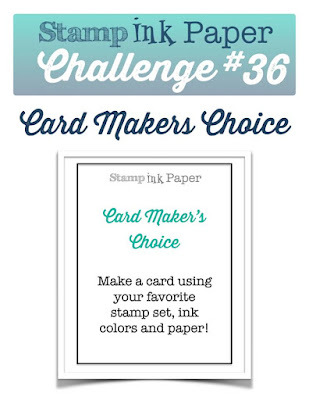 Welcome to the 36th Edition of the challenge at Stamp Ink Paper. Thanks for joining us, and thanks to the team for having me back now after my extended break for shoulder surgery. It will be another 11 weeks now I'm told until I'm fully functioning like normal again but this was a great challenge to return to light duties on. My daughters and I played with this technique used on the background of this card during my absence in their school holidays. It was quite slow going to complete this card, but I was itching to try out the Builder a flower framelits on this card. The cardstock I chose was Blackberry Bliss, Very Vanilla, Mossy Meadow, Rich Razzleberry, Pear Pizzazz and Brushed gold. The background was created with the Shaving Foam technique and reinkers of Mossy Meadow and Blackberry Bliss. The background for this one was created by my eldest daughter Karree. The Birthday greeting comes from the Hostess stamp set Happy Birthday everyone. It's my daughter Anna's 15th Birthday today and I had to make a special card even though she told me she just wanted a Black card. Black does seem to be her favourite colour of late. Almost all her wardrobe is black. My daughter is also a Star Wars fan so I decided her black card would be Darth Vader. Here it is. This card is an easel style. I used a picture from the internet and paper pieced the helmet together. There was a lot of handcutting involved. Unfortunately., I'm out of practice and not really my strength at the moment after surgery. Please don't look too close as the flaws will be seen, lol. The greeting is from the Hostess stamp set called Happy Birthday everyone. The inside of the card. I've particially embossed the inside Whisper white card with the Lucky Stars embossing folder and used my Wink of Stella on some of them. The card I'm sharing today was made in a hurry. I was told it needed to be simple, not fussy, no cars, plains, bikes or old man stuff like a world atlas, lol. You see it's for a teenage boy, a school friend who doesn't like anything in particular. I was told it had to be plain. This is what I managed to come up with on the spot, when I'm really not meant to be crafting yet, but it did allow me to use something of the new products. The paper used on the background of my card is from the Going Places stack from our Occasions catalogue and the greeting is from the Sky is the Limit Sale-a-bration stamp set. The cardstock is Basic Black and Sahara Sand. The greeting has been cut with the Xlarge oval punch and layered onto a mat cut with one of the Lots of Labels dies and raised on foam. The only other thing added was some Sahara Sand candy dots from the neutrals pack. I haven't been able to blog much of late due to surgery, but it did get this card done for Valentine's day to showcase some of the new goodies for my weekend workshop. All the ladies that attended were keen to get back to some crafting and I don't like to dissapoint. I've had to take quite a long extended break. Without further waffling here's one of the cards I made for showcase. I've used the Blooming Hearts bundle for this one with cardstock of Blushing Bride, Basic Black and Whisper White. The black background was embossed with the Lovely Lace embossing folder.